One good friend of Pala sent these recent photos to remind us all why gems are exciting and valuable. They are always found in difficult places, it seems. The lore and adventure to get them is an age old treasure hunter’s dream. Our supplier’s jeep in the Shigar Valley mountains where the pegamatites form, producing fine aquamarine for cutting and specimens. 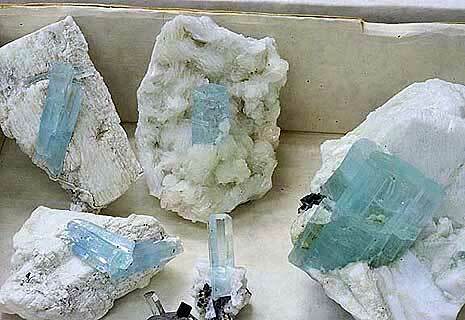 7/20/2005, Northern Areas, Pakistan: Currently there is not too much production of good quality specimens. The miners are working, but they say that this year has not produced as much as in previous years. There is also a lot of competition in procurement from the mines. I have seen a lot of dealers who participated in the Sainte-Marie aux Mines show and will also participate in the Denver show. The big dealers who have a hold in the mines do not want other, smaller dealers to buy from the mines. When I went to the mines many of us were told we couldn’t buy specimens at a preferred price, so no need to show us, etc. Obviously this breeds resentment. On the one hand, big dealers with their cash are seen as creating problems for the little guy; on the other, it is seen as the “partition of God,” so they can’t do a thing. When you are able to buy from the mine, it is important to pay a good price to sustain a relationship. The technique of big dealers is to buy some times very expensive and some time cheap. I have bought specimens from the miners and have given them my cell and office numbers and told them they can call me when something special is mined. Shigar River Valley aquamarines from a recent supplier. Traversing the river early in the day before it reaches dangerous flood stage, washing away many vehicles that try to cross. One friend of Pala had a close call when the vehicle he was traveling in made a crossing and was indeed flooded, just this past month in these same rains. A view from the Shigar Valley. The terrain around Dassu, Gilgit Division, Northern Areas. 7/19/2005: I was “imprisoned” in the Shigar Valley. There were floodwaters at our back side and front side. I left Scardu but the roads were blocked from seven different sides. The weather was not good, the flight canceled, and the road was blocked. The drive from Scardu to Peshawar was 36 hours because the road was very bad due to sliding. P.S. I have amazing pictures of the “magic room” where D. bathes and I have also bathed. It is a natural hot-water spring. Very good for health. When you are in Pakistan I must take you there and you will also bathe. Rest and recuperation: A wonderful hot spring in the village of Chutrung that many gem dealers have used to soak away the day’s driving bumps and grinds. This mine, near the Nit Valley (near Shigar), continues to be worked, usually in winter. Coming from Dassu Village near the Nit Valley, our supplier was told by miners that this mountain is known to hold mineral specimens and so is the next to be explored. A rainbow over the “Aqua Valley”!